Surface plasmon resonance (SPR) is the most commonly used technique to determine accurate binding kinetics. One of SPR’s advantages over other techniques like ITC is that it only requires a small amount of sample. But as with any technique, there are tricks to getting the most our of your experiment and the instrument. Preconcentration is a great method to increase the concentration of your ligand at the surface of the sensor. This allows researchers to use even less ligand when conducting SPR experiments. Since expressing and purifying proteins is time-consuming and purchasing proteins can get expensive, saving as much ligand as you can is always ideal. A lot of users were asking us to explain preconcentration, so we put together a blog post to help out! Preconcentration is a covalent immobilization method that can be used to obtain a high ligand concentration at the sensor chip surface prior to the injection of analyte. This technique can allow a localized ligand concentration greater than 100 mg/mL, even with a very low initial concentration. Preconcentration has significant benefits for carboxyl sensor chips, but limited effectiveness for chips based on ligand binding to pre-immobilized tags. Preconcentration uses electrostatic forces at the surface of the sensor chip to increase the local concentration of ligand at the reaction site on the sensor surface. This is typically used when large ligands, such as proteins, need to be immobilized to carboxyl sensor chips. A very high local concentration of ligand can be achieved at the surface, even with a very low initial ligand concentration (typically 10-100 µg/mL) Some ligands are unsuitable for preconcentration. Preconcentration can be achieved by reducing the pH of the activation buffer (the buffer the ligand is dissolved in) to below the pI (isoelectric point) of the ligand. This causes the ligand to be electrostatically attracted to the carboxyl surface, as the ligand will be positively charged, while the carboxyl surface will be negatively charged. This electrostatic attraction overwhelms any steric or hydrophilic stabilization. The ligand will accumulate at the surface until electrostatic neutrality is reached. Using a pH lower than the isoelectric point results in analyte with positive charge, and using a pH higher than the isoelectric point results in analyte with negative charge. A sensor chip will lose its pre-concentration capacity at a pH lower than 3. Note: Amine coupling is most efficient at a high pH as activated carboxyl groups react better with uncharged amino groups. Therefore the highest pH compatible with preconcentration should be determined empirically. Activation buffers are more effective when they have a low ionic strength (less than 20 mM) as this limits charge screening. Buffers with primary amine groups or strong nucleophiles like Tris or sodium azide must be avoided as these will compete with the ligand and lower the immobilization efficiency. The pH of the activation buffer regulates the rate and amount of the ligand that adsorbs to the sensor chip surface as it changes the surface and ligand charges. The preconcentration rate will also depend on the concentration of the ligand. A lower concentration is preferred as this provides more control over the amount of immobilized ligand. However, dilution of the ligand in the activation buffer may have some undesired effects when the ligand is not concentrated enough. The efficiency of the preconcentration is also proportional to the molecular weight of the ligand. If immobilization is not possible, another immobilization method should be considered. 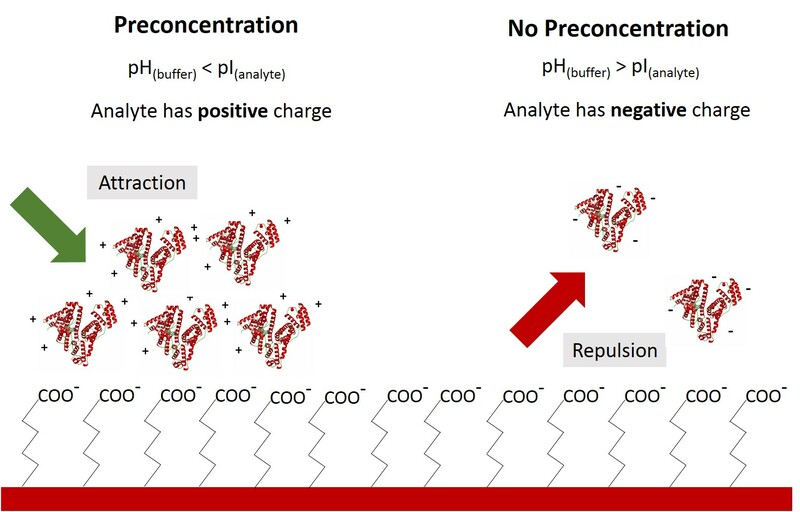 Preconcentration enables researchers to take advantage of electrostatic interactions to increase the localized concentration of ligands on an SPR sensor surface. Adding preconcentration to your SPR procedure will give you the ability to obtain accurate kinetic data, even with a very low ligand concentration. Nicoya provides an optimized activation buffer for preconcentration within their Amine Coupling Kit. Our application scientists can help you determine the right preconcentration protocol to reduce waste of your precious ligands! T. Gedig, Surface Chemistry in SPR Technology. In R. B. M. Schasfoort, A. J. Tudos, Handbook of Surface Plasmon Resonance. Münster, Germany, pp 195-197, 2008. P. A. van der Merwe, Surface Plasmon Resonance. Oxford, London, pp 12-14, 2001.